When I finished this my husband said he wished his Mother was still alive as these were among her treasures and memories from their years spent in the Far East in the military. 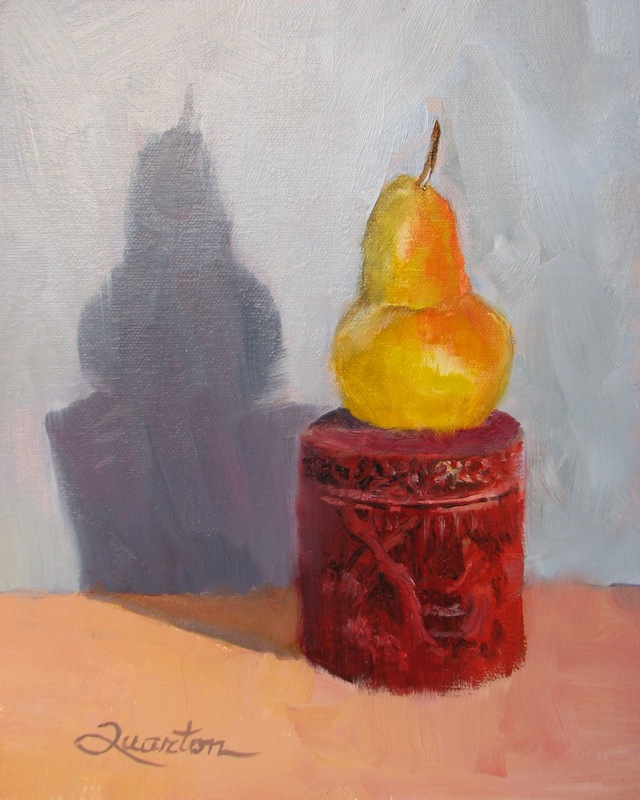 I really like painting silver or any bright shiny object because of the opportunity it gives one to show reflections. One of the harder things to accomplish is getting the feel of the silk as in the hanging scarf and the scarf on the tabletop. The cups and small plate are Rooster China which is hand-painted bone china. I'm taking a workshop next week with Dreama Tolle Perry which may take me in a totally different direction than what I've been doing lately. She uses a huge palette so getting used to that will be interesting too. Lots of new things to learn as always! Isn't that what keeps this art business fun??? While looking in my hall closet for a certain tablecloth, I came upon a "smallish" plastic bag with a twist-tie on it. I had no idea what was in it as it had been hidden there for "centuries". When I opened it this Oriental silk scarf plus two others were the treasures I found. They are all so gorgeous and very frail so I carefully spread this one out and walked around the house trying to figure out what to use to complement the scarf. 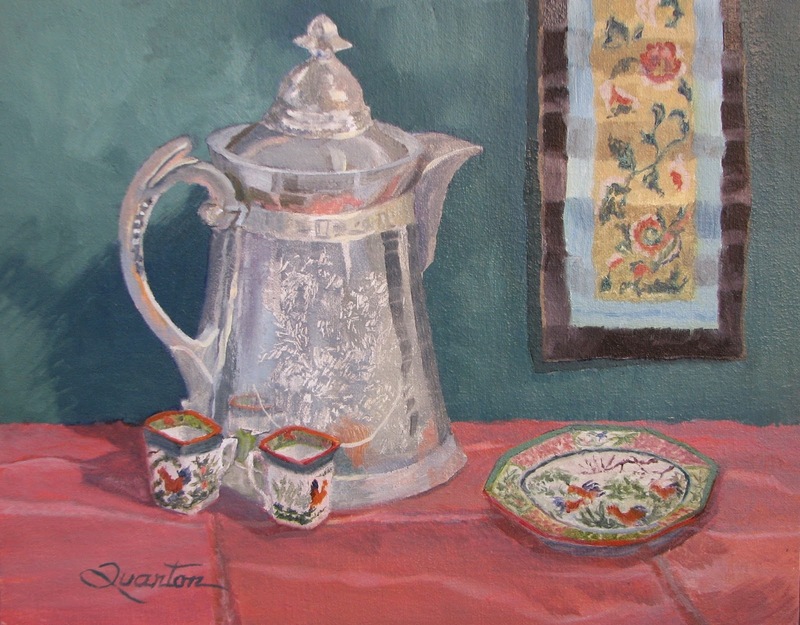 The silver pitcher seemed a no-brainer and then I decided to add one of the cups from our Rooster china. My parents-in-law were in the service stationed in China in the early 1920's and brought home lots of wondrous treasures. I think this squash is called a "Snow Cap" which would make sense. For a squash it is really amazing. I added in a tube of the orangish paint that was used in its making. Lots of fun!! A fancy iris to add to the collection. This one was definitely a challenge (I seem to be saying that a lot lately!) and I had never dared to try it. So, I guess my skills are improving as I am actually happy with it. I used to have a lot of this iris but they are all gone....I loved them for their feminine little white edging and gorgeous purple falls. Another of nature's wonders. I've always been intrigued by the variety of fancy squash that we see in markets this time of year. Thought I would paint a few of them just for fun. This is the first of the series and I finished the 2nd today which I will post in a day or two. The patterns and shapes of the various squash are all amazing. I just wonder how they are hybridized? Enjoy (now I get to eat the pear)! 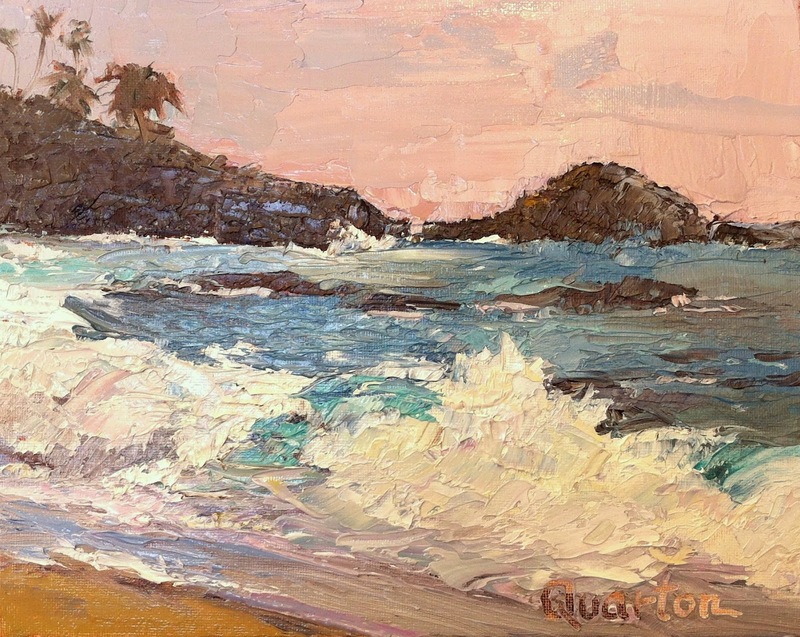 This palette knife painting was done during the summer while I was doing Art A Fair in Laguna Beach, CA. I really enjoyed doing it and working at getting the warms and cools right. The flowers of an epiphyllum plant are so pretty, but the plant itself is rather awkward and ungainly (at least mine are). We only have two left, but my father-in-law had many of them. They were all out sitting on top of his block wall that lined the property in their backyard. They were quite a sight to see when they were all blooming. 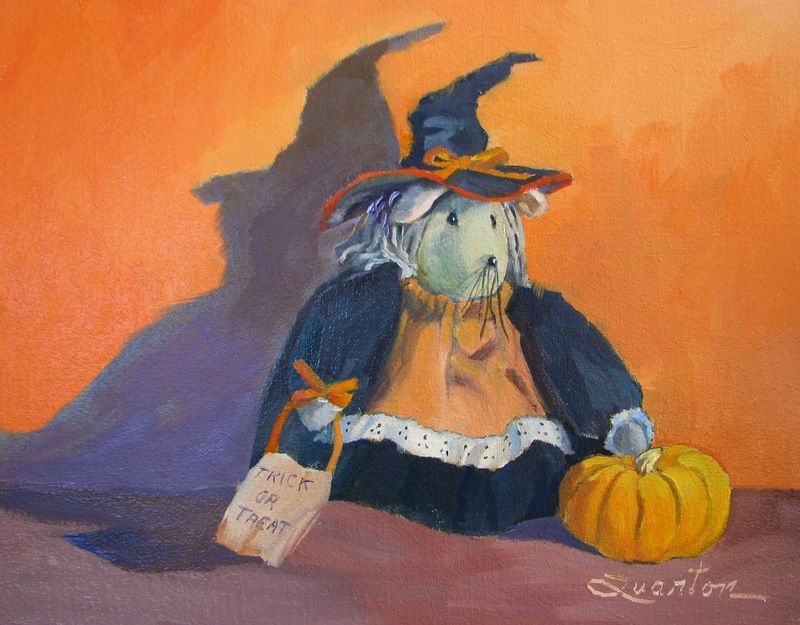 This painting is for Day 30 of the Leslie Saeta Challenge. The little girl is my Grand Daughter and she loves the water. As you can see she is running for all she's worth to get there. After doing flowers for 29 of the 30 days of the challenge, I wanted to try something different. I haven't really done figures except for a drawing class years ago so this was a challenge. The 30-day challenge was fun, but I have to admit I am ready to kick back a little bit and maybe sleep in a time or two. I did a wonderful workshop with Tom Balderas last Friday. He is very helpful and caring and is great with color. He really opened my eyes so now I have to go practice what I learned. Happy Painting to those of you who are painters!!! Wow, only one more day to go after this one on the Challenge....The last ten days have been tough, but also very informative. I guess it is good to force yourself to do something like this. 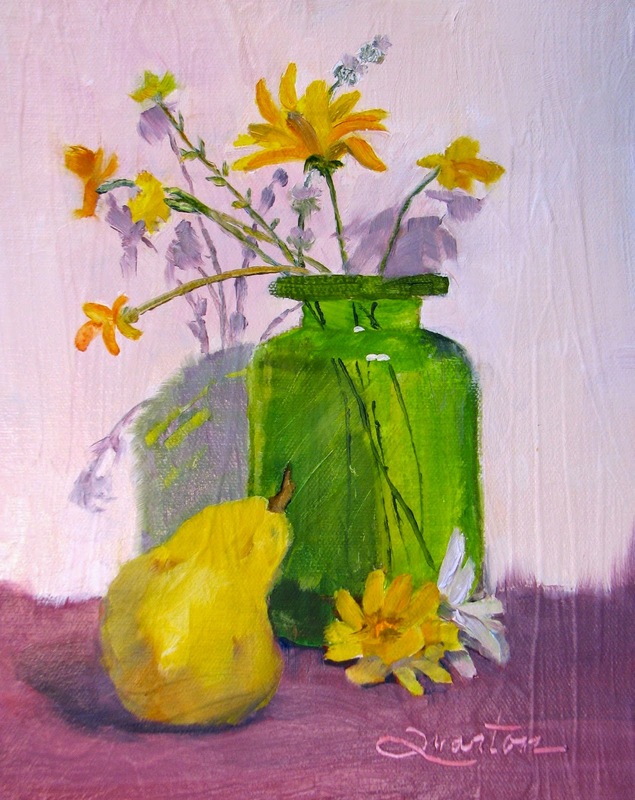 When I started I thought I would take it easy and not force myself to do a painting every day. Leslie says to just have fun, but I was a little past fun and really wanted to go all 9 yards (30 days). It does give me a feeling of accomplishment and satisfaction, plus I learned a few things! 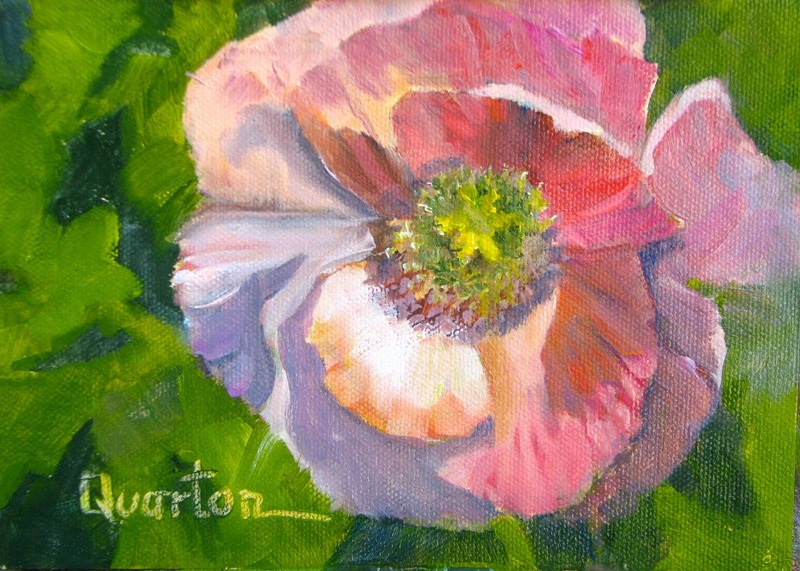 Just one more painting and I'll have reached my goal of 30 flower paintings in 30 days---can I do it? Yes, I can! God willing! Only 2 more days to go on the challenge after today. The most difficult thing at this point is figuring out what to paint. I pledged (to myself) to do flower for these 30 days and I am running out of inspiration and photos. However, it has been interesting and beneficial. I would highly recommend doing Leslie's next challenge for any of you who are painters. 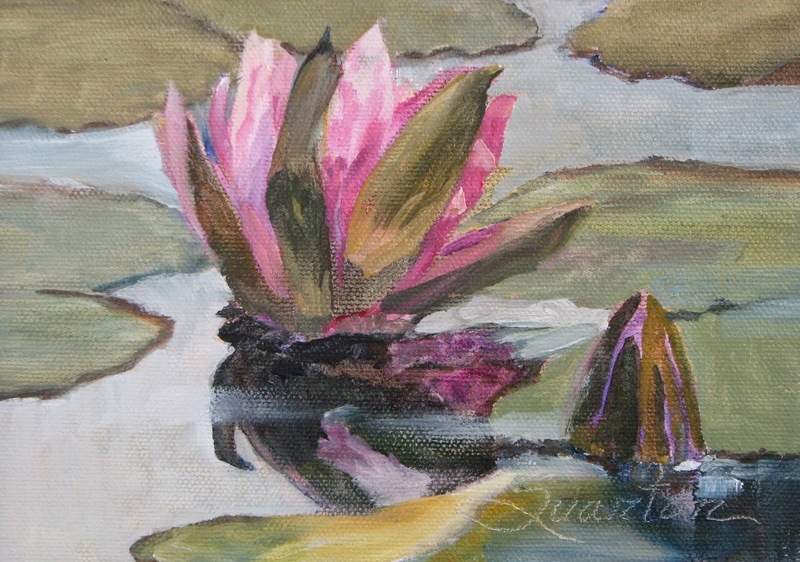 This was from a photo that I took at one of the lily ponds at the Mission in San Juan Capistrano. I wish it wasn't so far from my home as it always has a wealth of flowers to photograph along with the fabulous and interesting architecture. 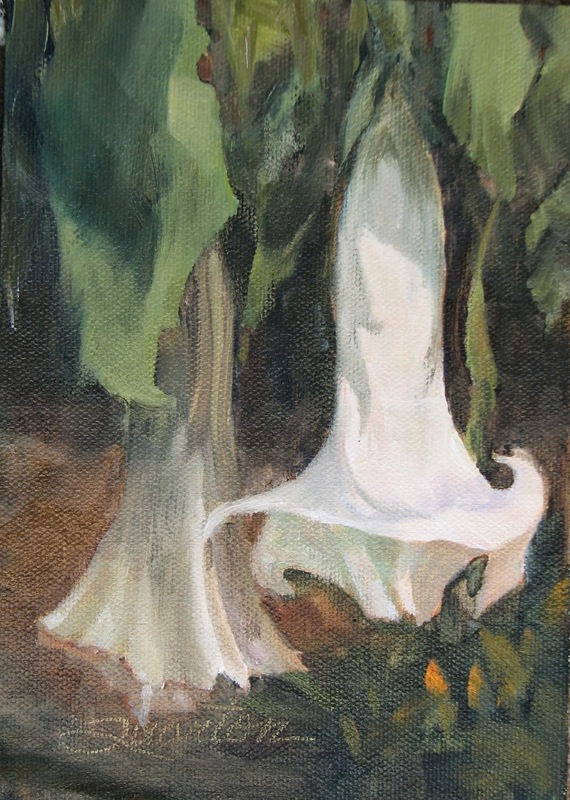 I don't know why I named this Waltzing Matilda except that the name came to me as I was doing the painting. 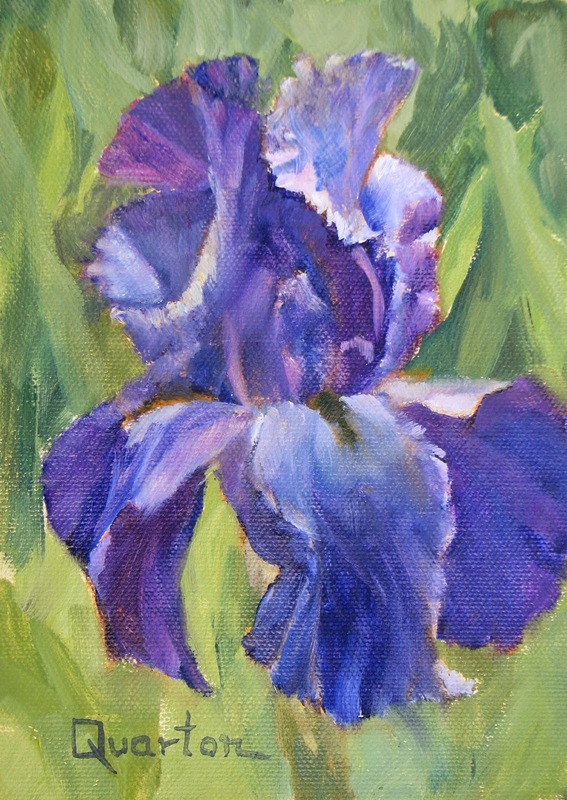 The lovely "falls" on the iris seemed like an old-fashioned gown swirling around and I envisioned the iris as a dancer. This painting was labor intensive but enjoyable to do. I feel that this challenge has really helped me break through some painting blocks (in other words I've learned a few things). They say that to really get good you have to cover 10,000 feet of canvas (along with learning the principles). I may get there before it's all over! ........THAT'S A "MAY", but the journey is half the fun! For me, composition seems always to be a challenge (along with all the other challenges of painting!). 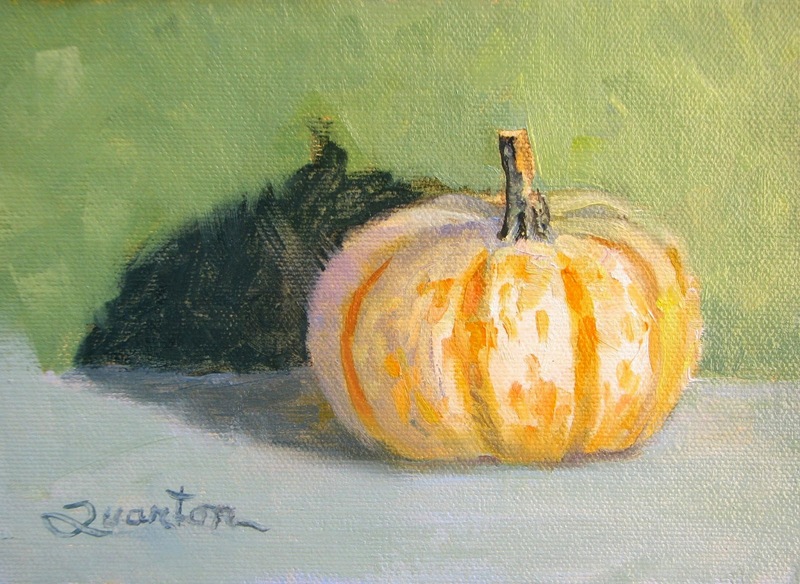 I remember one of my first teachers (in watercolor), Robert E. Wood, saying "Big, Middle and tiny (or tiny, tiny, tiny). He was talking about values and shapes. It's so difficult to follow that concept as I tend to place too many lights in the darks or darks in the middle values and then the whole concept is blown! Hopefully I did OK here. These two Gerbara Daisies seemed to make such a sweet couple thus the name "Just the Two of Us"
Have a great day and thanks for looking.. I'm doing a one-day workshop with Tom Balderas tomorrow so have finished two paintings today so that one will still be posted tomorrow. 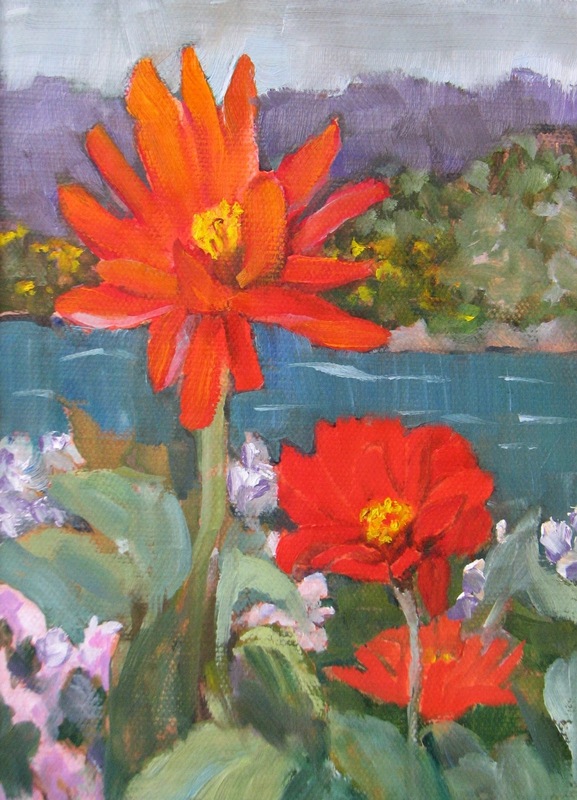 I switched to palette knife on this painting. It seems so appropriate for Sunflowers. 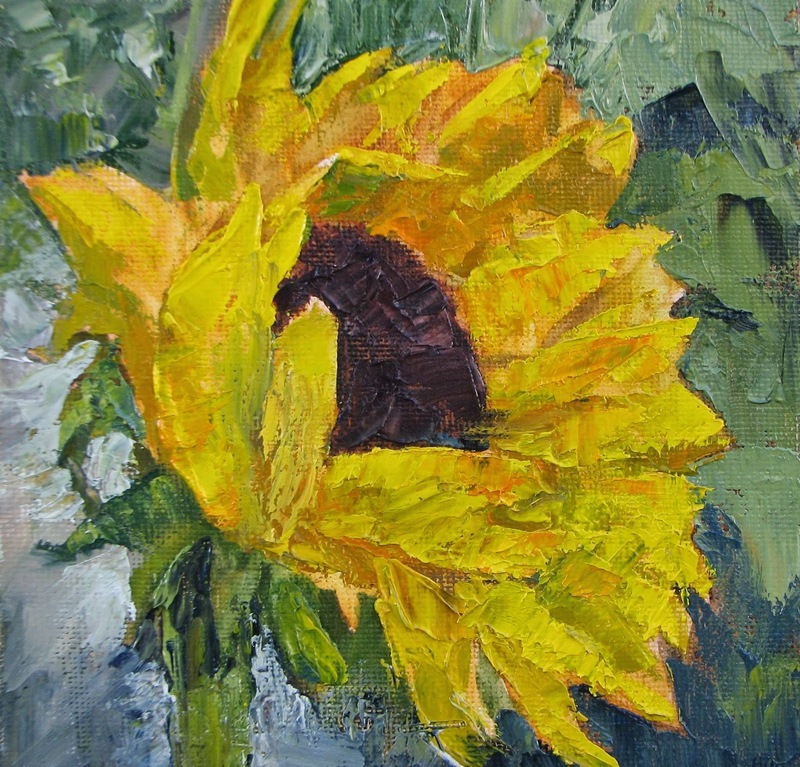 If you are a painter and haven't tried using a palette knife, try doing a Sunflower with one. Somehow the texture just works with them. I teach a class at a show call Art A Fair that goes on in Laguna Beach all summer and when we do Sunflowers, everyone is always happy with their results. Enjoy! I chose another Iceland Poppy today from my photo file. I seem to be in an orange groove lately. I do love the bright color, but will try to step back next time. I can't wait until next spring to get some more pictures of them. They are quite amazing, but so fragile. I tried to plant some one time and the wind got to them before they were even at their peak.. This is all "fictitious" except for the flowers that I found at our local nursery. I decided to place them in a happy background by some other flowers, water and mountains. I heard of a man who did a challenge of 24 paintings in 24 hours--I cannot imagine. That meant he had to paint all through the night at a different location each time! Any of you painters up for that??? I found these Daisies at a local nursery. Fortunately they were faring far better than the ones I found at the market the other day, but the nursery itself looked like it was going out of business. I think I will go back tomorrow and purchase these just as I did the orange ones from the market. Painting the 6 x 6's is really fun and the small size makes the composition more manageable. I normally do a "pre-plan" but so far haven't had to on the floral 6 x 6's. Does anyone out there that paints feel the same way??? 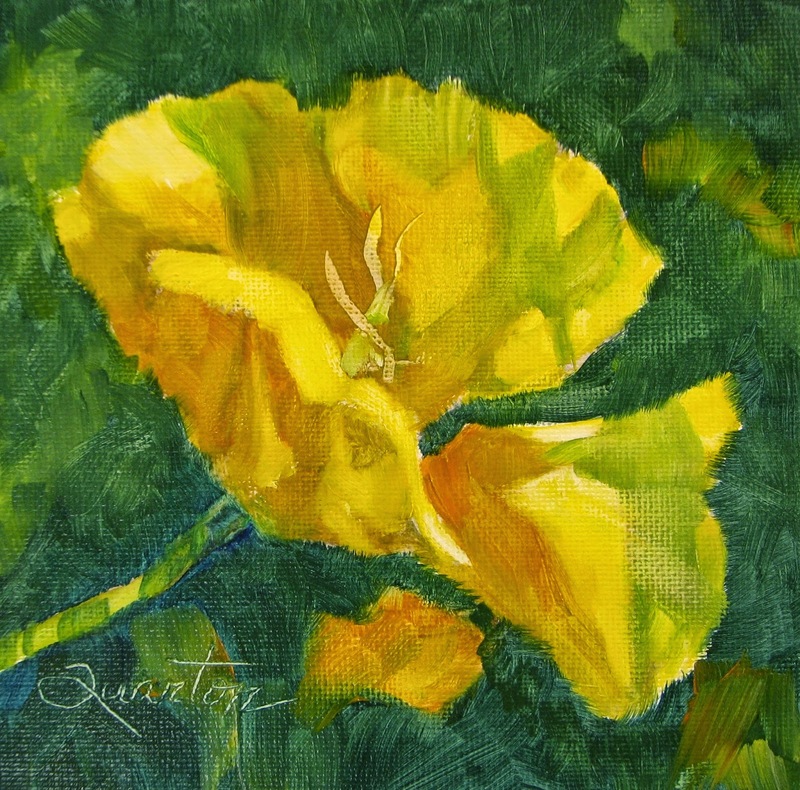 I called this one "Getting to Know You" because I truly felt like I was getting to know this pansy. Every time I thought I understood where the petals were going in the photograph I would look more closely and find there was more to it than had met my eye! Thanks for reading my long drawn-out tale of saving (hopefully) some flowers! As I was leaving the grocery store today these flowers caught my eye. The entire display was suffering from the terrible heat we've been having. I'd have watered them if I could have, but guess they would think I'm crazy. Anyway, these flowers were still hanging in there so I took a couple of pictures and came home and painted them. At least they're immortalized if they don't make it. They were fun to paint and not nearly as complicated as I'd thought they might be. One just never knows! A red rose from my garden that I hope you all will enjoy. The 30 paintings in 30 days really is a stretch, but I think I'll make it. This is DAY 18 and I tried to do a painting that was a little easier than yesterday's effort. Of course this took longer than I had planned, but not as long as yesterday's. Working with reds can be tricky and I found everything was getting a little dull so I wiped off the more critical areas and went in with some brighter red which I think did the trick? 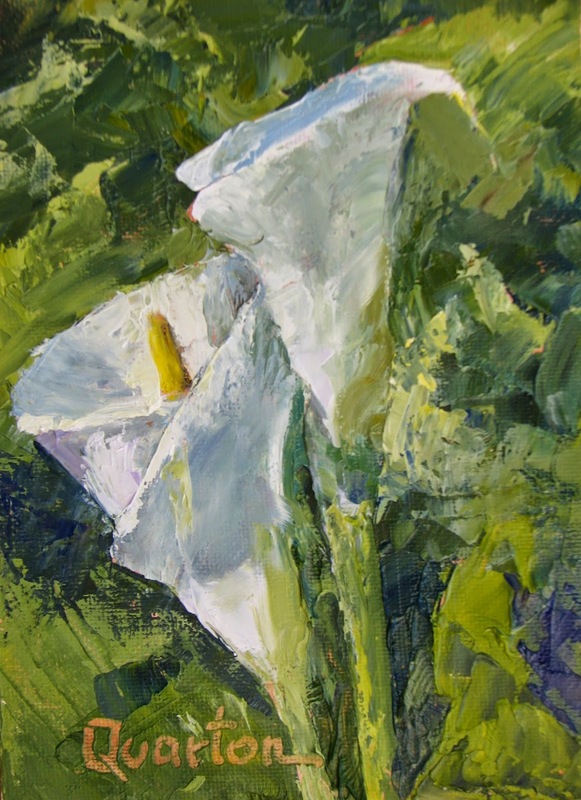 Having been a watercolorist for so many years, I feel like I'm "cheating" when I do this but then this is one of the advantages of oil--it's flexibility! PRICE: $75 PLUS $5 TO SHIP IN U.S. 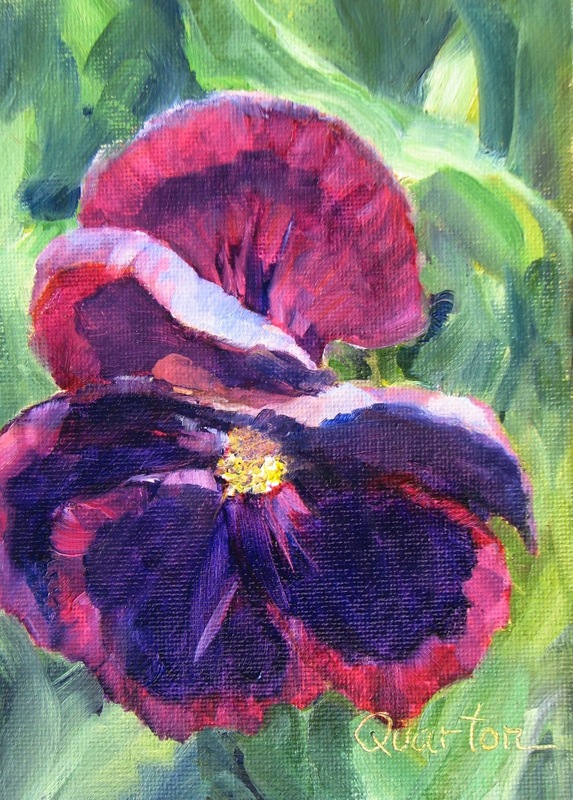 This hibiscus was painted from a photo I took of the flowers at the San Diego Zoo. I know, I took some animal pictures too, but these hibiscus really caught my eye!! They were the most unusual ones I had ever seen and they were huge!!! They were growing near where the Flamingos are kept (in case you are ever there and want to see them. This was definitely a challenge (for the challenge) and I'm happy with it for my first attempt. I'd decided to try it as I finally had a day free to paint and I ended up spending most of the day doing the painting. Something easier tomorrow, please! I tend not to like the grain of the canvas to show through so have found adding a layer or two of gesso on most canvases seems to help--sand after each one for some tooth. I painted this from my photo once before (and may try again) and found the shadows very challenging so thought I would try again. Shadows are so much harder than one would think--particularly on a surface that lets the sun shine through. The only way we ever get these things right is to keep trying---and trying! 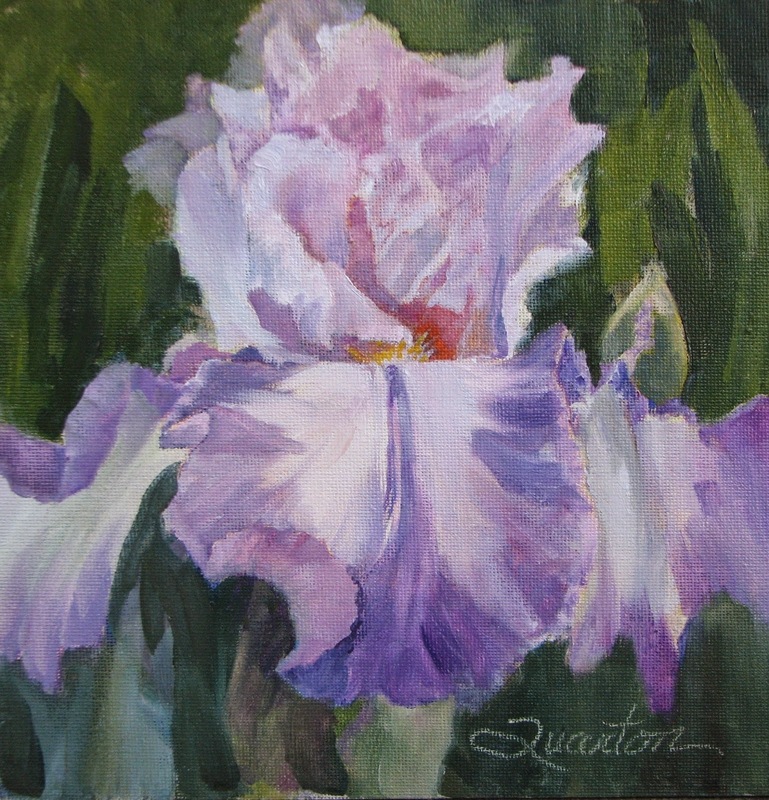 I finally got my 6 x 6 canvases so thought it would be fun to do an iris close-up and personal. The smallest I had been working recently had been 5 x 7 (which is actually smaller in square inches by l) but somehow because of the landscape format they seemed larger. 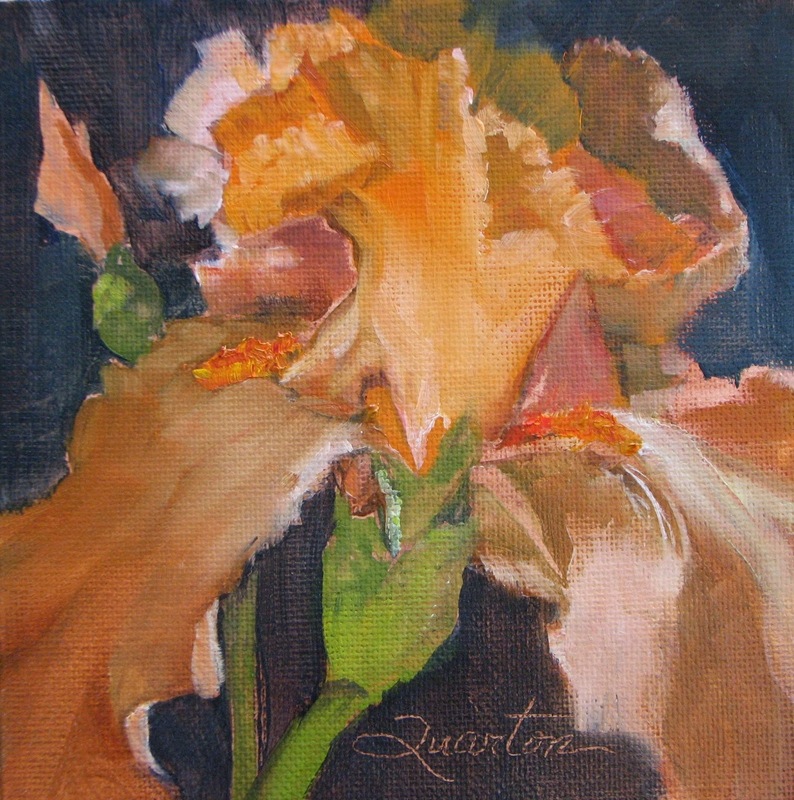 6 x 6's are interesting to work on and I enjoyed doing this one. I don't know the proper name of this iris as I took the photo elsewhere. 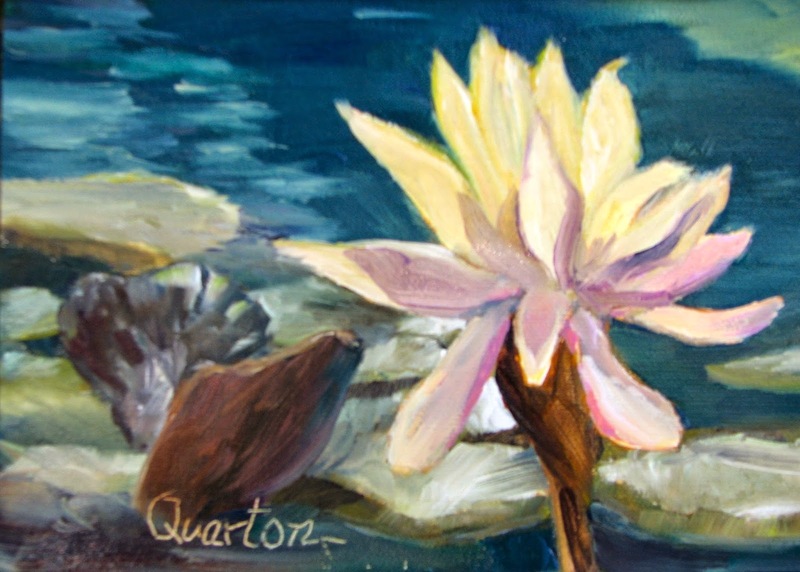 I just finished a waterlily picture from the Mission in San Juan Capistrano so was into the file on flowers from the Mission. The Trumpet flowers are so beautiful and the Mission has two trees of them. These are of the Brugmansia family and are very poisonous and also very beautiful. 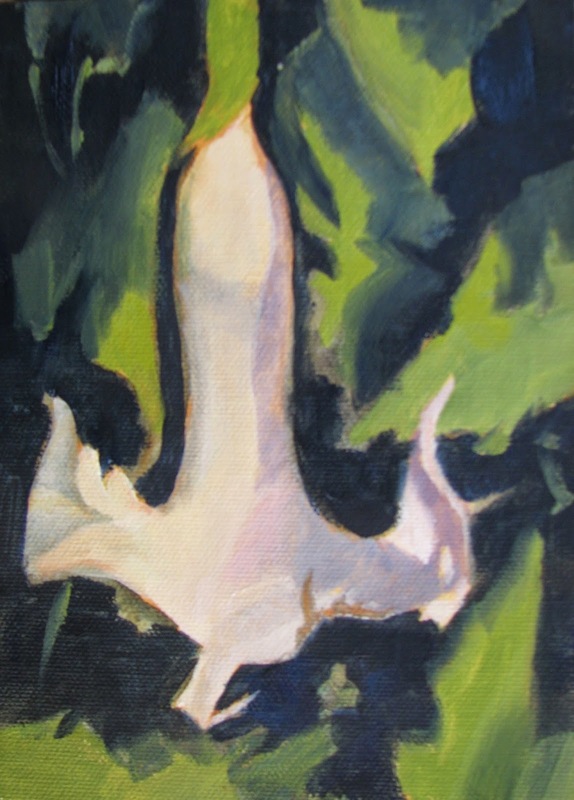 They are also called the upside-down flowers, topsy turvy flowers and Angel's Trumpet. Wow! This truly is getting challenging! Fortunately I have lots of flower pictures on my iPad to choose from, but it is getting more difficult to select one--and there's more than half the month to go. 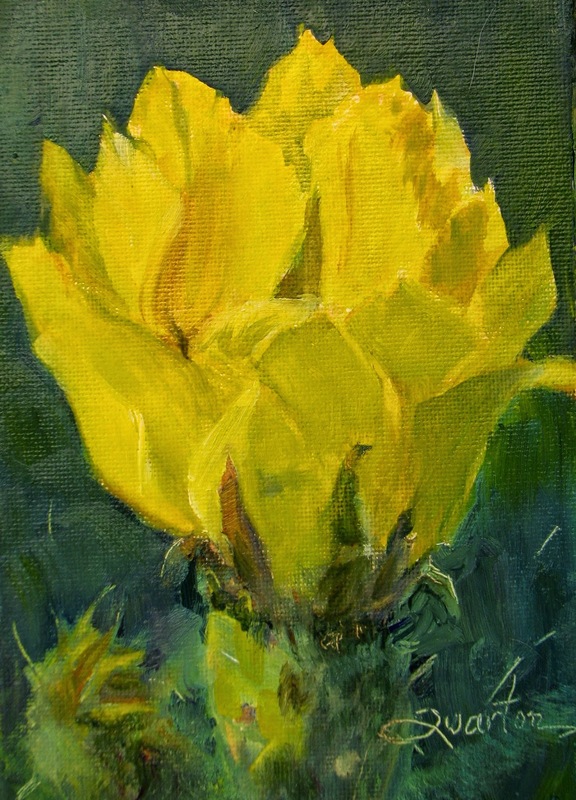 I originally chose flowers as my theme so am enjoying doing these little paintings! This was such fun to paint. I'd always been intimidated by all the wrinkles in the petals, but they were not that difficult to define. The flower is actually called a Matilija Poppy and it is amazing to watch it bloom as all those petals come out of a tiny round ball and of course that is what causes them to have all the wrinkles. The longer they are out the straighter they become. PRICE: $95 PLUS $8 TO SHIP IN THE CONTINENTAL U.S. 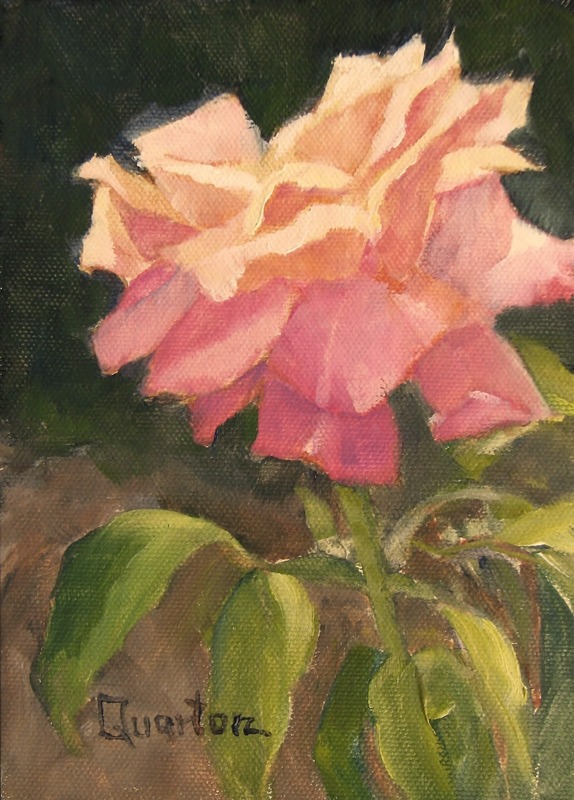 This was inspired by one of my roses called Ingrid Bergman. She normally blooms beautifully but has a set-back this year because of the re-planting. So, I just enjoy my older photos of her. There's always hope for next year. Just a simple little pansy showing its lovely face. 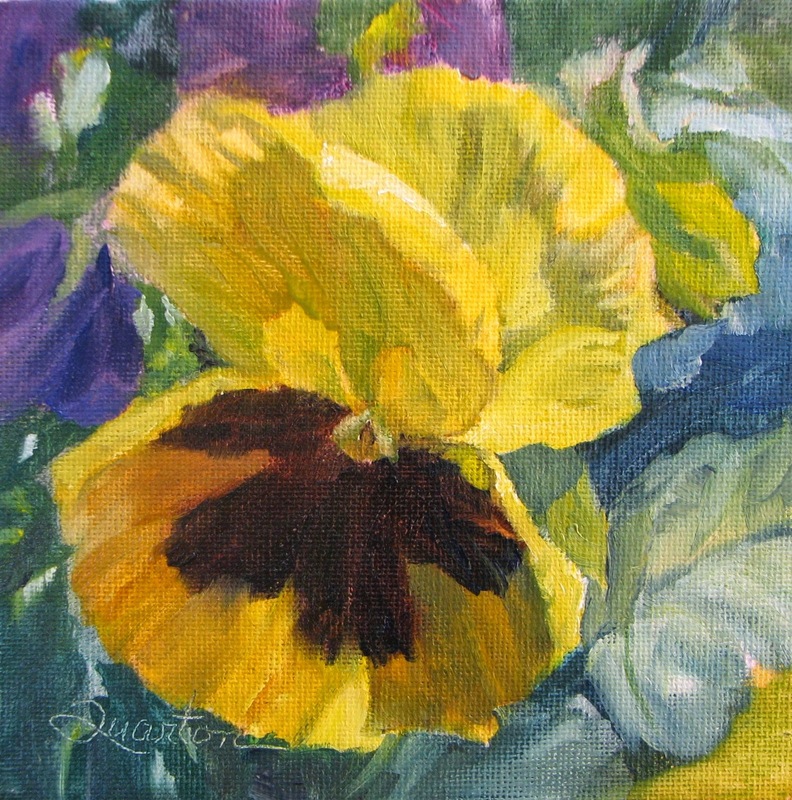 They're all lovely (pansies) and more of a challenge to paint than one would think. While doing this challenge I find myself getting close to falling behind and so I pick a painting that I think will be easier than some of the others. Not so in this case. Oh well, I was up late! 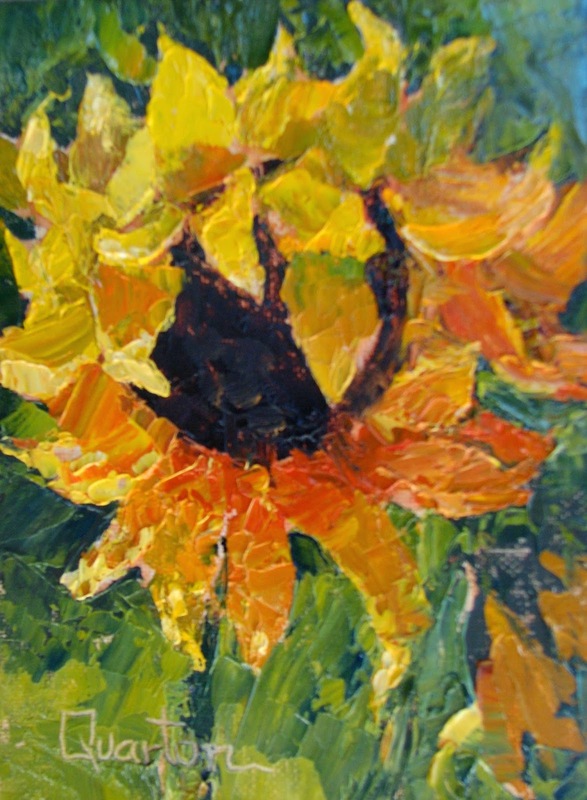 I know, I do paint a lot of Sunflowers! However, they are fun to paint and I've recently discovered how much fun it is to paint them with a palette knife. If you haven't tried using a palette knife yet, I highly recommend it. You can get such beautiful, clean color and lots of texture. To get into tiny areas, just load the color on the knife and then wipe away all but the size of the area you are trying to cover...It's really fun to experiment with. Hope you enjoy! 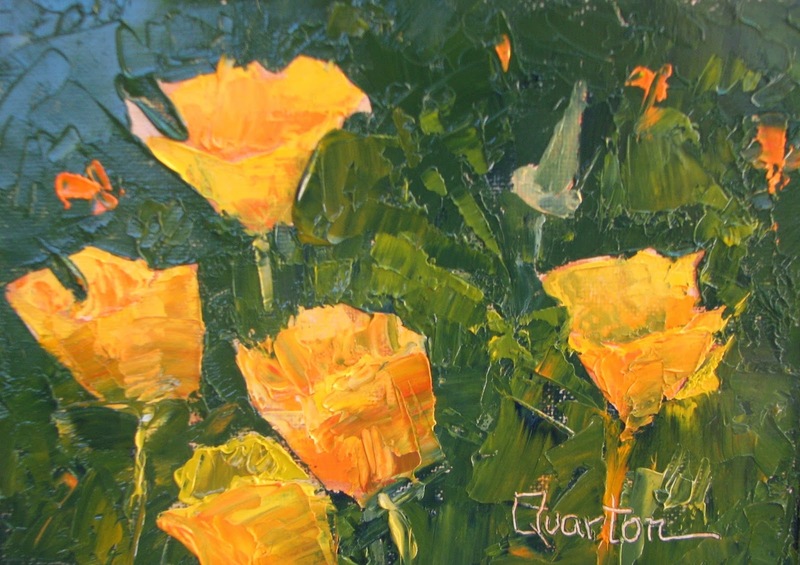 I did these poppies with palette knife and tried to make them looser than some previous poppy paintings I've done. Not sure if it worked or not but must get it out there for the challenge. I just listened to Leslie interview Elizabeth Pollie on blog talk radio and Elizabeth says she does a lot of scraping and re-arranging. I tried a little of that on this painting and will try to remember to do more of it. I know occasionally I have done a passage in a painting that hasn't worked and I've gotten frustrated and just wiped it off. Sometimes it can leave magical paint behind. Now I shall have to remember to do it even if the area hasn't completely frustrated me. I know it won't always work and that's what scares me. Oh well, as Robert E. Wood used to say "it isn't precious!" 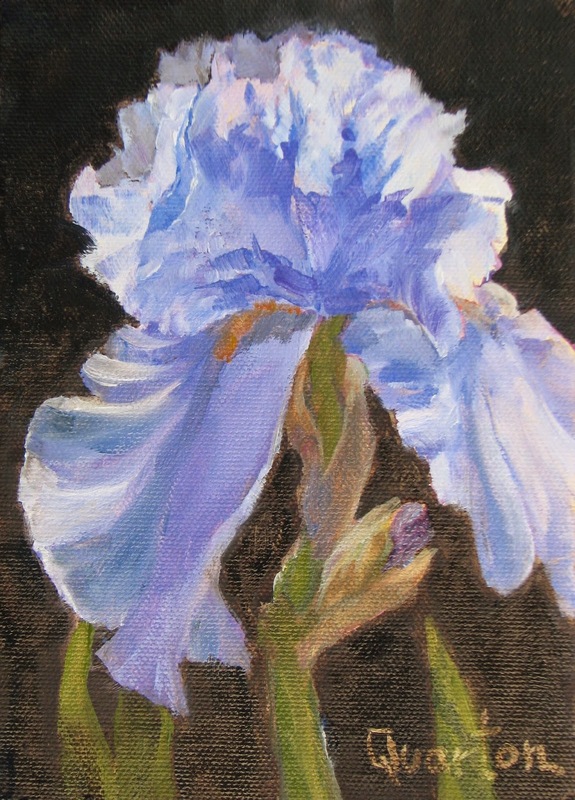 I do love painting iris! At this point I don't know the name of this particular one, but it has always been a beauty in my garden. I used to have lots of irises until we decided to move them and they didn't like the move so well. This is one that came through it all with flying colors. Hope you like it as much as I do. 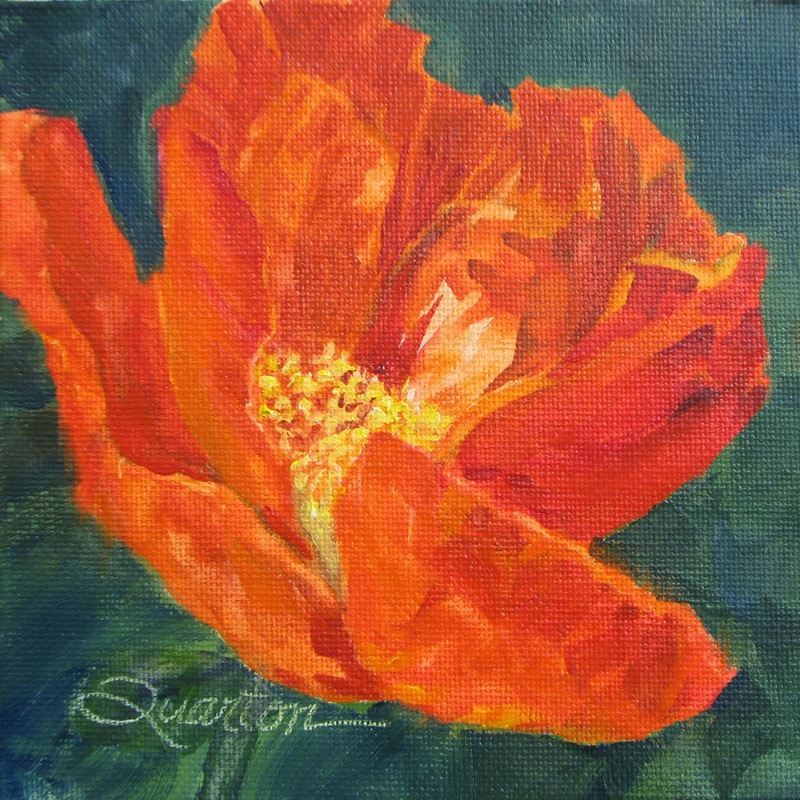 This painting was done from a photo of someone else's Iceland poppies. I've always admired them, but have had no luck growing them. Best to just borrow someone else's! 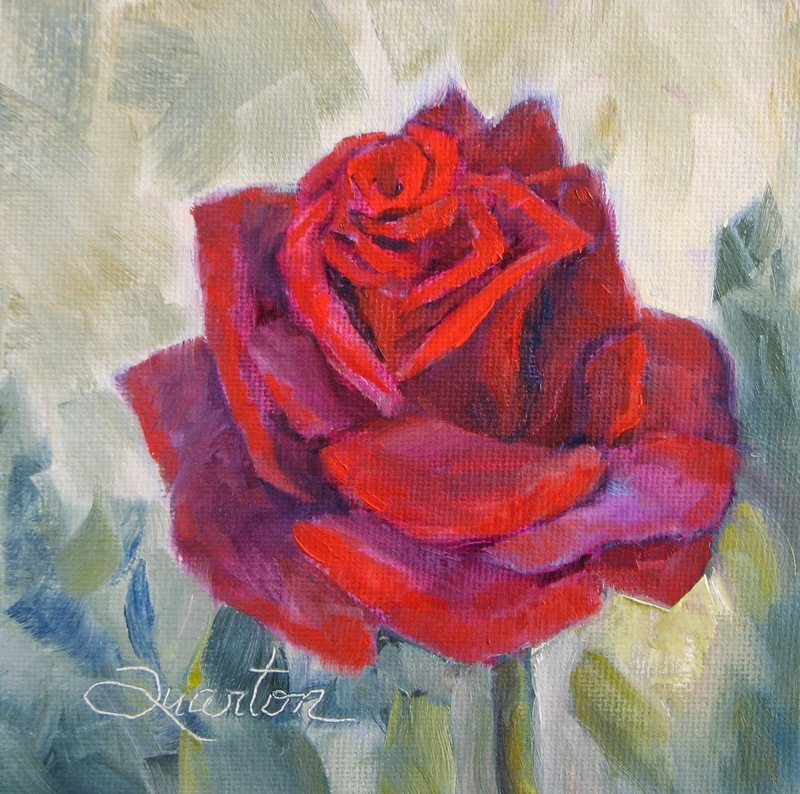 I decided to paint a rose for the challenge today. This rose is called "Dianna, Princess of Wales" and has always out-performed itself until this year. ( This is a photo from last year.) Last winter we decided to have some drainage work done in the rose garden so all the roses were taken up a little earlier than the actual bare root time. When we re-planted them all but one came back, but several of them are suffering and Dianna is one of them. My only hope is that by next summer they will have fully made a comeback. Fortunately I have quite a few pictures of the roses when they were all healthy. This is one of the purple irises that was very prolific in my iris garden. I guess purple irises are among the strongest. Seems they are traditional when one thinks of iris. I painted iris in watercolor for many years and was kind of known at Art A Fair as the "iris lady" (along with Iris Adams). I tried taking the picture of this with my iPhone camera and it turned out very badly. I kept working with the adjustments and it still looked awful. So, I switched to my good old faithful Cannon and it came out perfectly the first time. I seems my paintings don't translate well with the iPhone??? Don't know why but the color just comes out strangely. I entered this yesterday in the Leslie Saeta 30 painting in 30 days challenge, but I messed up somehow and up with the Google word in my box??? I'll try again today as it is impossible to get rid of a flub (at least I don't know how) on the challenge. Soooo, since I've still done a painting each day and have another one to enter, it will have to post tomorrow. These are callalilies from my yard. They grow in various places and are not to be deterred. I tried to get rid of them in one spot, but they came back anyway. I do love them when they are blooming, but they can be quite "unbeautiful" when they are not as they are tall and rangy. 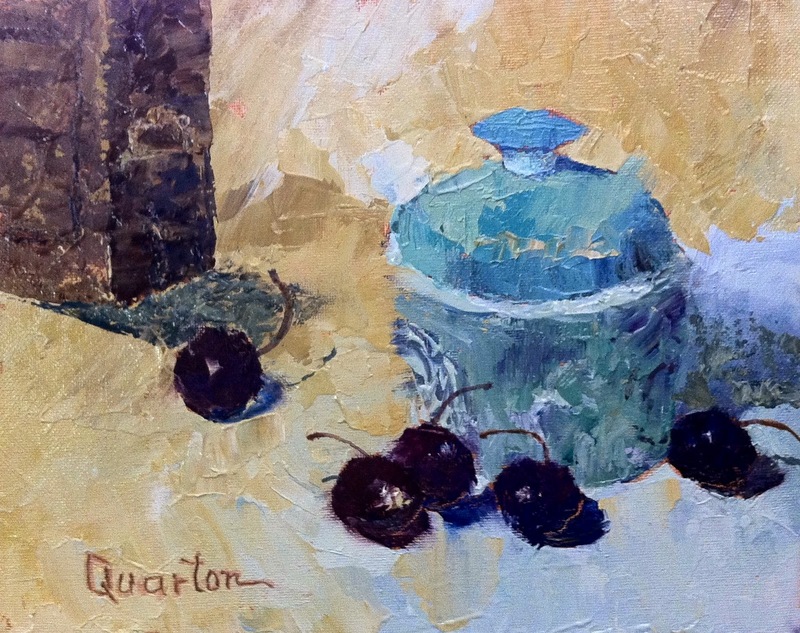 email me or phone if interested--quartonfineart@yahoo.com or 714-271-1135. I've been painting lots of sunflowers lately. They are such happy flowers and they make you feel good just to look at them. I'd purchased a bunch of them to paint, but then just took the "star of the crowd" and placed it in a blue cup. #1. These are only 5 x 7 in size so could make a fun grouping. 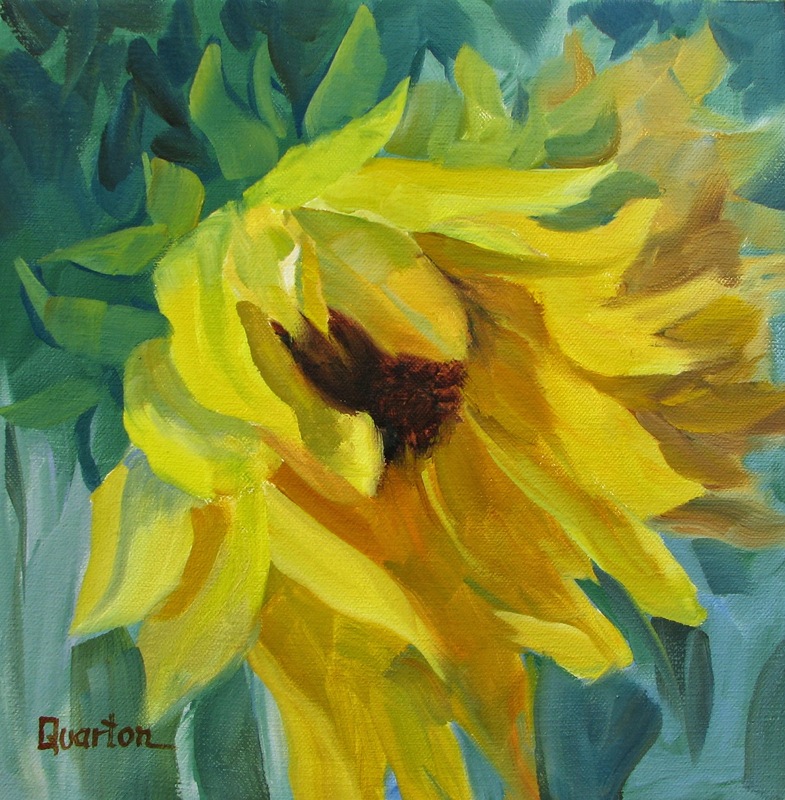 I've been collecting photos of sunflowers for a long time and thought it would be fun to paint a series of them. An early morning shot from a viewpoint at Victoria Beach in Laguna Beach, CA. It was oh so refreshing! Painted with palette knife. can resist--either to paint or to eat--or both which was true in my case. 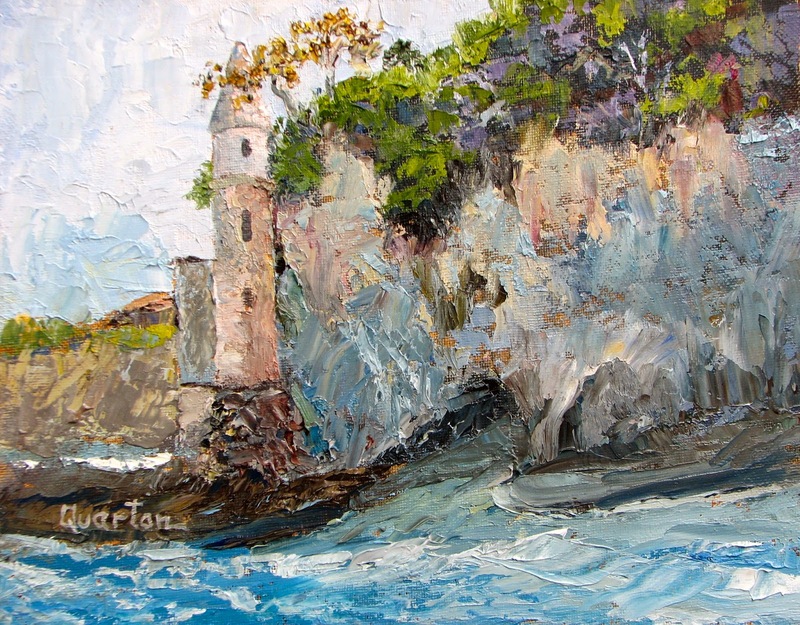 The painting is done entirely with a palette knife. I wasn't sureI could accomplish the cherries that way, but I think they look pretty good! Hope you like them! I recently walked to this beach from Pacific Coast Hwy and Victoria Street to see the tower I had long heard about. Getting there is not easy and I can't imagine trying to haul all my painting gear there. Also the tide comes in and I've heard of painter's being trapped there--that wouldn't be fun!!! Anyway, I walked from PCH to the beach. It was beautiful and the tower is worth seeing. I got some good photographs to work from. I was parked waiting for my husband to come out of the auto repair where we had taken our van to be serviced. This fireplug caught my eye with its bright orange color so I took some photos. As I was doing that Bill came out along with the Manager of the repair shop. He asked why I was taking photos of a fireplug and I said I was going to paint it. Of course he didn't know I was an artist and he looked quite worried. 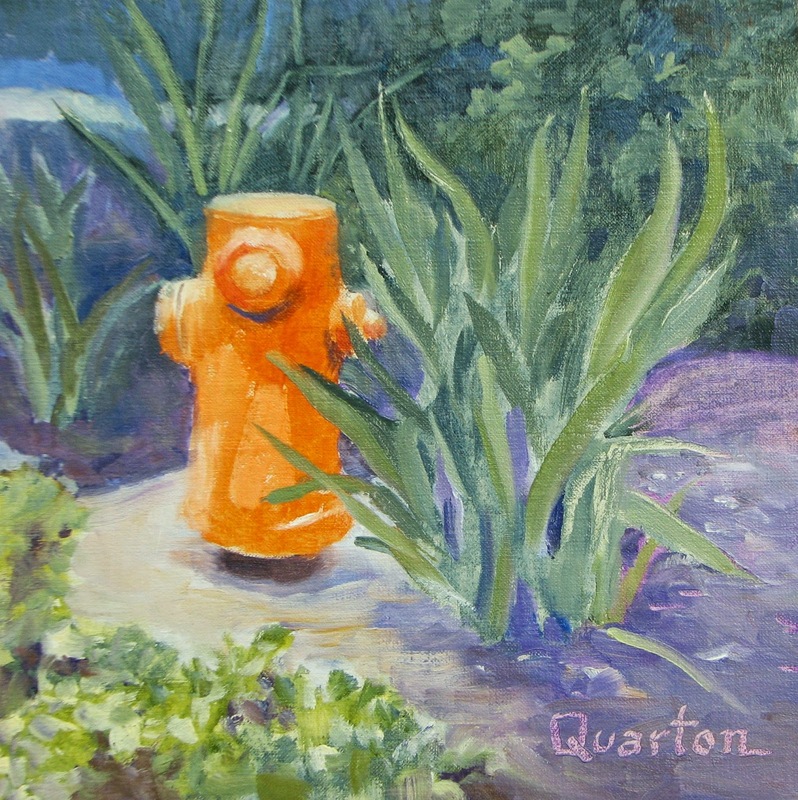 I finally told him I was going to do a painting of it--not paint the actual fireplug! This is a painting of a bouquet given to me by a friend in thanks for my taking care of her kitties while she was out of town. 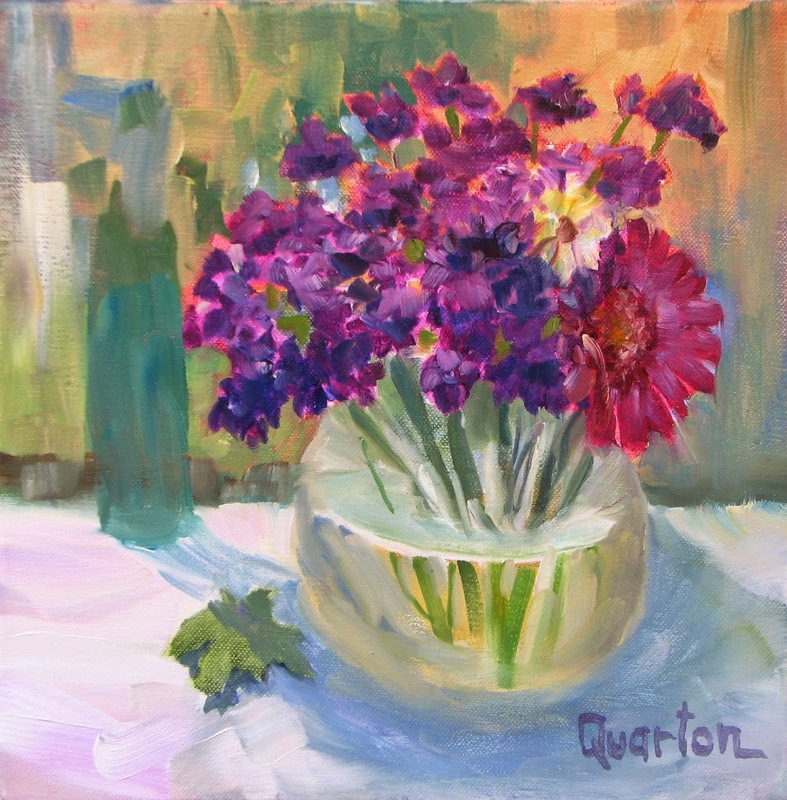 It differs a little bit from the original bouquet because the one white flower in the bouquet was some kind of Queen Anne's Lace, but it didn't last long enough for me to paint it. Instead I had to put in a little white Daisy. 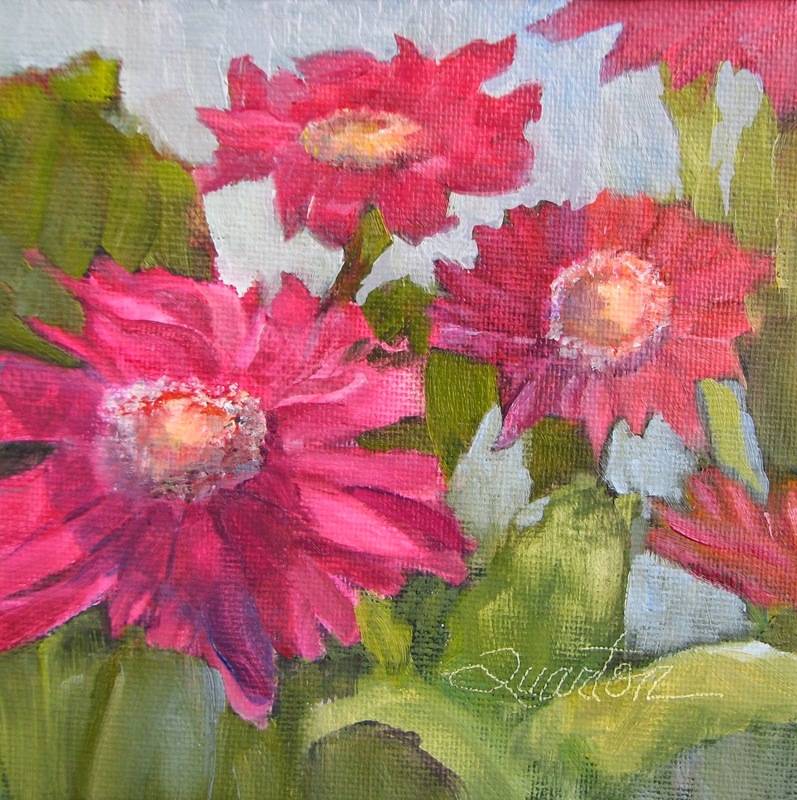 The Gerbera Daisy was original. The purple flowers resembled violets but were some other kind of flower of which I don't know the name. 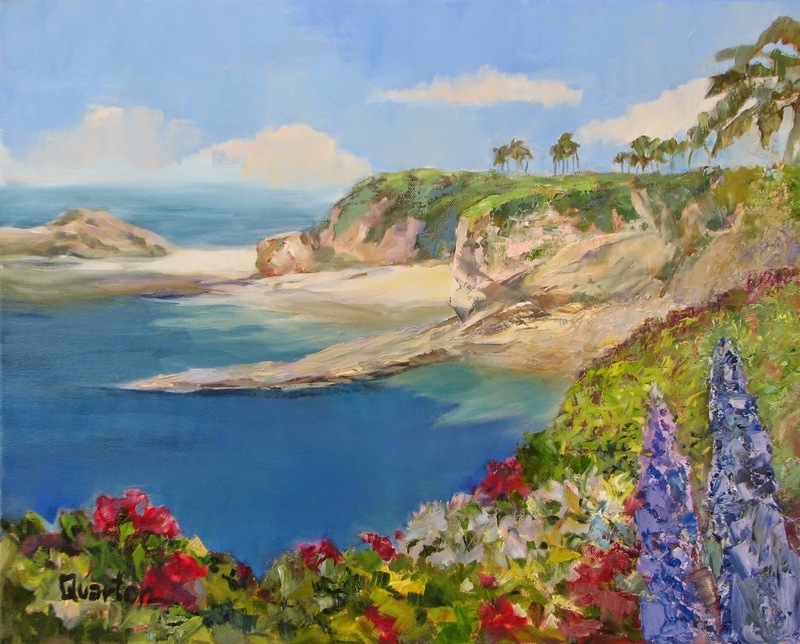 The Art A Fair show opens in Laguna Beach next Friday, June 25th, so if you are in the vicinity come for a visit! 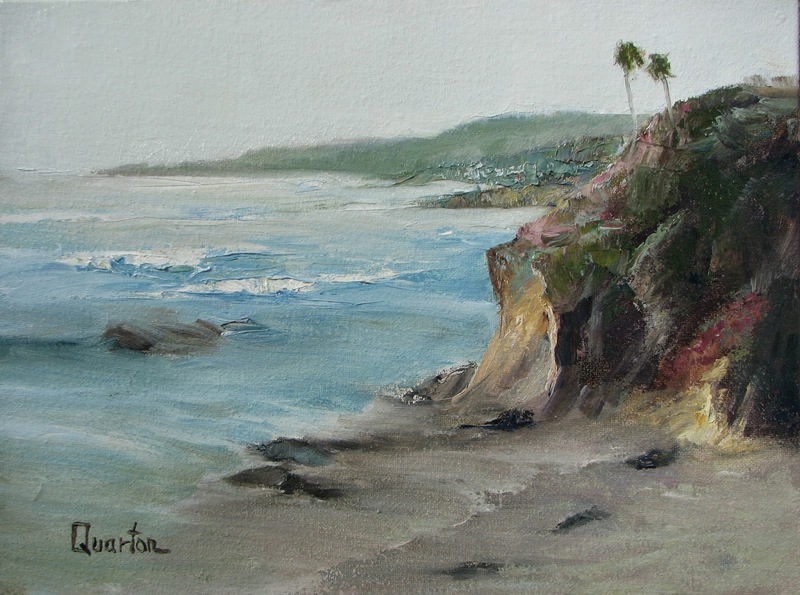 This is a view from one of the bluffs at Heisler Park in Laguna Beach, CA. 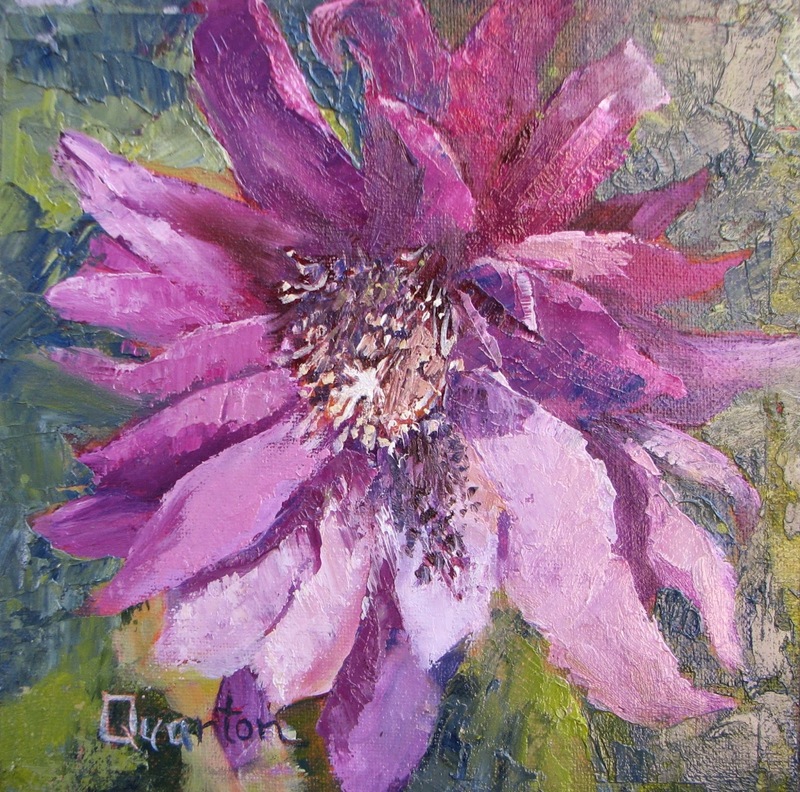 I used a combination of brushwork and palette knife to combine smooth areas with very textured areas. I'm getting ready for the Art A Fair show with the opening night on the 25th by invitation only and the 27th when we open to the public. If you would like a Pass, call me at 714-271-1135. This is always a popular view in Laguna Beach. Many couples have even been married in this Gazebo. 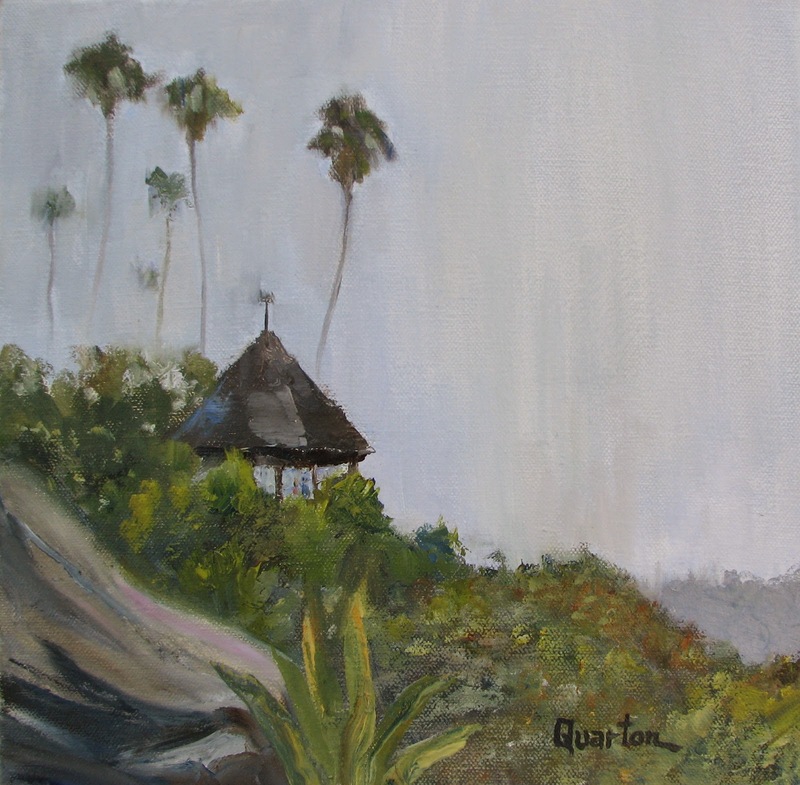 It's located at the south end of Heisler Park and to be in it and enjoy the view is a very enjoyable time. I even put a couple up there doing exactly that! 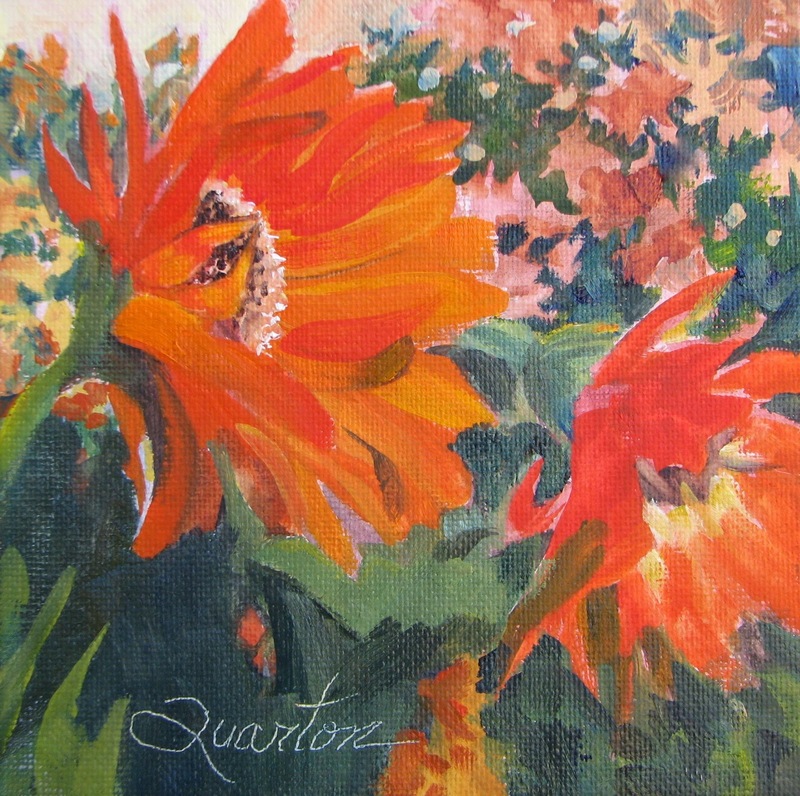 I painted this from a picture I took a few years ago of some sunflowers we grew in the backyard. They were the biggest ever and the birds loved the seeds once the flowers were done. I've tried to grow some since then without the same luck. I think I will try again! 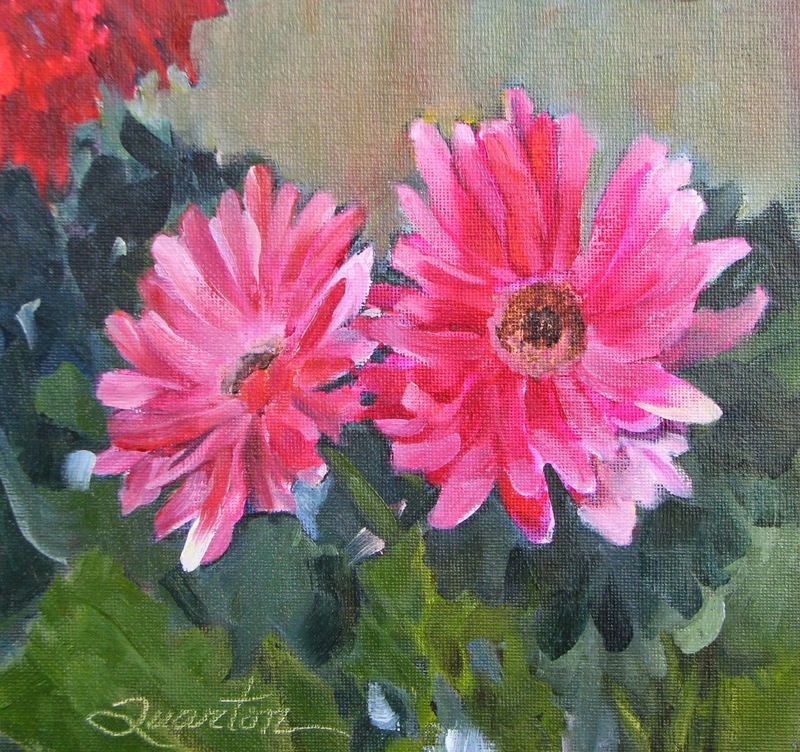 www.loriquarton.com. I live in an equine-oriented community. I've had horses most of my life, but am now "horse-less". We have an acre of land which I try to keep filled with flowers (depending on the time of the year). I attended Oregon State University, then worked as an office manager, and then as a flight attendant for United. After getting married, I worked for Xerox as a Customer Representative in the state of Nevada. I have lived in New York City, Guam, San Francisco, So. California, Oregon, Washington, and Nevada (Las Vegas)--not necessarily in that order! 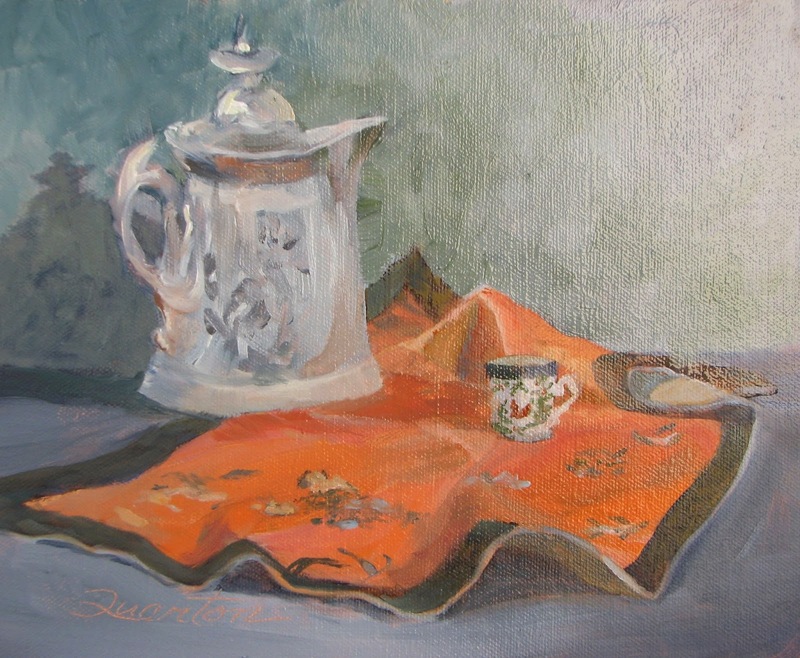 I have been into art most of my life and started seriously painting about 25 years ago. Painted first in oils, switched to watercolors and now do both. Painting is a passion with me and I'd rather be out on location painting plein air than almost anything else.